HOW DOES THE GAC SYSTEM WORK? As the New York Department of Health announced in February, the full capacity GAC filtration system is operating effectively. For more information on how GAC Filtration works, please watch the video below. How water makes the journey into your home depends on many variables. For more information on this process, please watch the video below. 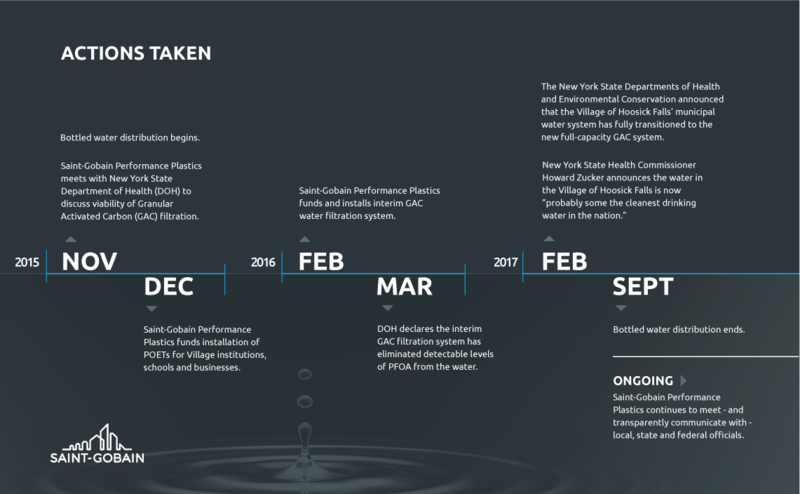 WHAT ARE THE ACTIONS SAINT-GOBAIN PERFORMANCE PLASTICS HAS TAKEN SINCE FIRST LEARNING ABOUT THE PRESENCE OF PFOA IN THE DRINKING WATER IN HOOSICK FALLS? Since learning there was PFOA in the groundwater in Hoosick Falls, Saint-Gobain made it a top priority to provide potable water to residents. From the early and extensive bottled water program, to the granular activated carbon (GAC) filtration systems on the Village of Hoosick Falls municipal water supply and the installation of the point-of-entry treatment systems (POETs), all of which we funded, it is a tribute to our ongoing and continuing commitment to this community. We have fully cooperated with the authorities in investigating the sources of PFOA and remain committed to working with the New York State Department of Environmental Conservation (NYSDEC) in this regard. WHY DID SAINT-GOBAIN TAKE THESE ACTIONS? The answer is simple—we are committed to this community. Even before investigations into the source or sources of PFOA, we made bringing potable water to the residents of Hoosick Falls a top priority. As the largest employer in the area, the wellbeing of our employees and the broader community is top of mind. We want to remain an important and positive part of this community, and to see all aspects of this community continue to flourish and thrive. IS THERE PFOA IN MY DRINKING WATER IF I'M A RESIDENT OF HOOSICK FALLS? For those Village residents not on the municipal water supply, the point-of-entry treatment systems (POETs) that have been installed work in the same way as the GAC on the municipal supply and effectively remove PFOA from the water. HOW OFTEN IS THE WATER IN HOOSICK FALLS TESTED AND WHO CONDUCTS THESE TESTS? The New York State Department of Environmental Conservation is responsible for conducting ongoing tests of the drinking water. For the first three months, the NYSDEC tests twice a month. After the first three months, tests will be completed once a month by the NYSDEC. For those in the Town with private wells using point-of-entry treatment systems (a single home version of the GAC) the NYSDEC is also responsible for ongoing testing taking place twice a month through a three-month period, and then transitioning into once a month. WHO IS SAINT-GOBAIN PERFORMANCE PLASTICS? We are a part of the Hoosick Falls community and have been for more than 17 years. We are largest employer in the Village, with approximately 200 employees. Manufacturing in general in Hoosick Falls is not what it used to be, and many of these operations have sold, shut down, downsized, or moved away. But when others sold or shut down, we stayed, and Saint-Gobain Performance Plastics intends to remain as an important member of the overall Hoosick Falls community. The high technology products manufactured by our employees in Hoosick Falls compete on a global basis, and they are proud of the quality of our products and the impact they have on enhancing the industries we serve. We are committed to this community in many ways, and it is in our collective best interests to see Hoosick Falls flourish. From an environmental standpoint, we set extremely rigorous standards for ourselves in connection with things like energy and water conservation, as just two examples. Saint-Gobain Performance Plastics strives, globally, to be a leader in sustainability and in the environment. This is a collective and continuous effort as we all work to improve our environment. In addition, we adhere to applicable laws and follow industry best practices when it comes to the management and disposal of materials used in our various facilities. WHAT DID THE NYDOH FIND IN CONNECTION WITH THEIR INVESTIGATION OF CANCER INCIDENCES IN HOOSICK FALLS? • for all cancers combined. These findings appear to be consistent with analyses by several other government bodies, including the VTDOH. The Business Council of New York pens op-ed ahead of the Drinking Water Quality Council’s October meeting. Click here for a link to the Village of Hoosick Fall's Frequently Asked Questions. Saint-Gobain pens Letter to the Editor in the Niagara Gazette. Please note that responses to all inquiries may not be possible, and we will update the FAQ section of this site based on the questions that are most commonly asked.